About 4,000 students have rallied in Paris against the far-right National Front (FN) party, following its success in the European elections. Smaller marches took place in Toulouse, Bordeaux, Nantes and outside the European parliament in Strasbourg. Marie Le Pen’s National Front came first in last week’s European parliament elections, winning 25% of the French vote and 24 seats. The party is opposed to mass immigration, free trade and the euro. 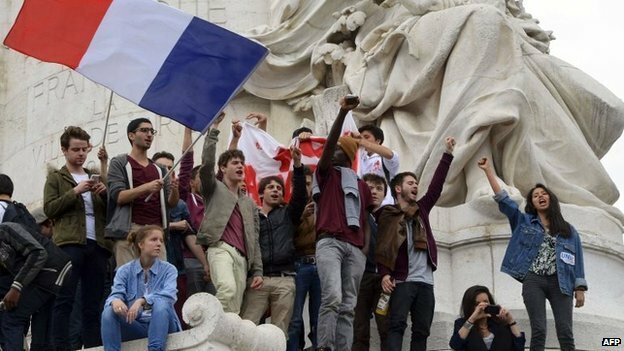 In Paris, students shouted anti-right wing slogans and waved banners reading “No to the National Front”. However, correspondents say the turnout is small compared with previous protests against the FN. Following her party’s victory, leader Marine Le Pen said voters had demanded “only one type of politics – a politics of the French, for the French and with the French”. She added that her party would put pressure on French President Francois Hollande and fight “crazy measures like votes for immigrants”. Marie Le Pen is credited with detoxifying the image of the FN, which was previously seen as the pariah of French politics.